“rich nations are demanding transparency in developing nations' actions to tackle climate change. 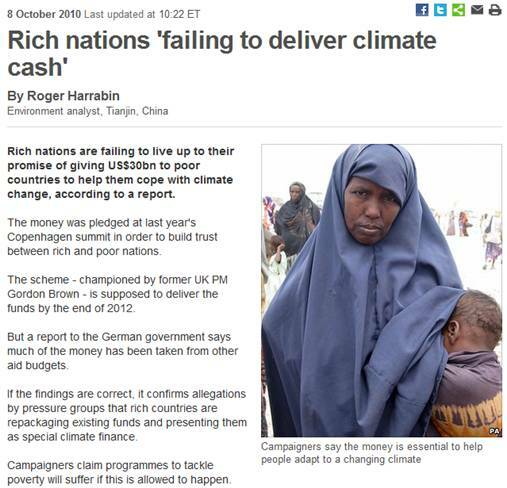 "There must be much better verification of developed countries' finance proposals," Xie Zhenhua, China's chief climate negotiator, told BBC News. Bill Hare from Climate Analytics said: "This is a really important issue because so much trust has been lost in the climate negotiations with so many rich nations failing to live up to their legally binding targets to cut emissions, then asking the developing nations to do more to tackle climate change. "This fund will look like a scam if it's not improved. If you can't have trust - and this process has been severely damaged by lack of trust - it's going to be very bad news indeed." 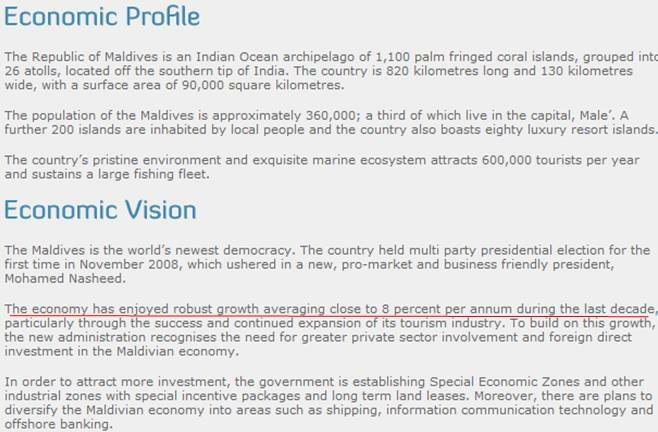 The Invest Maldives website “Why Invest In Maldives” page says: “The vast untapped potential in natural marine resources and the young, energetic and dynamic workforce are strong inducements to invest in the Maldives.” And: “The Maldives is socially cohesive, with a homogenous population that shares one culture, religion [Islam] and language.” (uh-oh: no diversity!) And on the projects pages of that web site there is a lot of construction activity going on in the Maldives. There are no sea level sites in the Maldives in the NOAA or PSMSL databases (which are based on gauge measurements). The closest is at Cochin, India and is shown below. Since 1960 there is no trend. 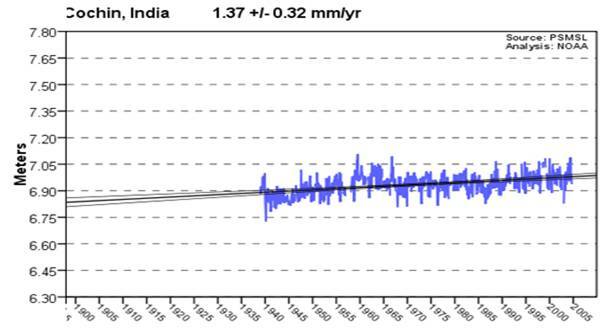 The following figure shows satellite-based sea surface height (SSH) for Maldives lat/long: 3N, 73E (plotted at [http://sealevel.colorado.edu/wizard.php]). 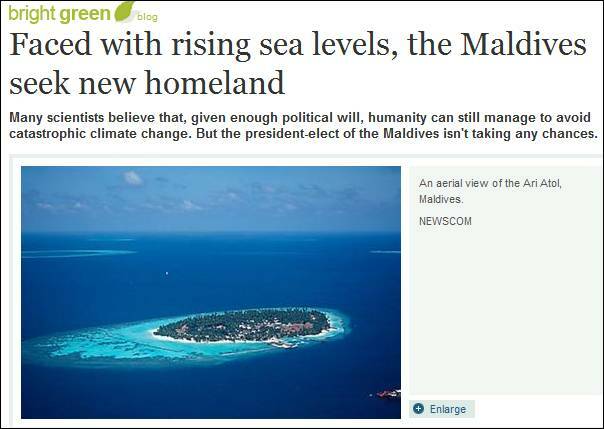 So while sea level rise at the projected rates can be accommodated by the coral growth, the expanding Maldives population is using up the coral as a building material and contributing to its demise through sewage pollution. And the “rich” nations must pay! [http://www.msnbc.msn.com/id/28800386/] A country ill-equipped to handle a pest outbreak since the “civil” war has reduced government capacity to deal with issues. Liberia has no long-term temperature stations in the Global Historical Climate Network (and only has one station total – with sporadic short term data). As in most of Africa, there is a severe data problem. The following figure shows the Hadley CRUTEM3 annual average temperature data for the two 5x5 degree grids covering Liberia (plotted at http://www.appinsys.com/GlobalWarming/climate.aspx). Recent temperatures are no higher than 80-90 years ago. Liberia’s population is about the same as the Seattle metropolitan area (United States’ 15th largest metro population [http://en.wikipedia.org/wiki/Seattle_metropolitan_area]), although Liberia is growing at a much faster rate. 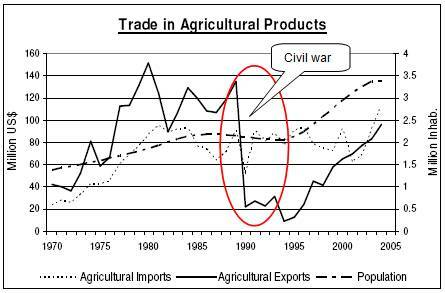 The following figure is from the above source, showing continually increasing agricultural exports and population growth, except for the civil war period in the 1980s / 1990s. Note that since the end of the civil war the population has increased by 75% in 10 years (by comparison, metro Seattle’s population grew by 10% in 10 years). One benefit of Liberia’s “civil” war: reduced deforestation. Disappearing wildlife is due to disappearing forests and over-hunting, not global warming. So once again we have a country with rampant population growth, extreme poverty, aggressive deforestation and devouring of wildlife, agricultural problems resulting from (un)civil(ized) war, and perhaps the world should help out. But blaming it on global warming and claiming money from “industrialized countries” under this pretext is simply dishonest. The blame game completely ignores Africa’s CO2 emissions from deforestation and biomass burning, and blames all African malnutrition and disease on U.S CO2 instead of on their deforestation and overpopulation.